Some frequently asked questions about investing in TripleNetZeroDebt.com properties. …to see video answers to a number of FAQs, watch Jason Schwetz, founder of TripleNetZeroDebt.com, by clicking here. TripleNetZeroDebt.com is a Real Estate Crowdfunding site that allows accredited investors to own an undivided interest in high-quality single-tenant, triple-net properties. It is a marketplace for accredited investors to pool their money together to purchase debt-free pre-screened single-tenant real estate along with other like- minded individuals. TripleNetZeroDebt.com allows accredited investors to review real estate ownership opportunities online through a private, secure website for free. Accredited investors can purchase an undivided interest in a TripleNetZeroDebt.com property online through this private, secure website. Accredited Investors can browse investments and due diligence information, review legal documents and sign documents securely online. A Member (also referred to as an LLC Member) is an individual who has become an investor in one of our LLCs that has invested (in most cases) less than $100,000 in a single property. Once an accredited investor has invested in an undivided interest in one of our LLCs, they will be referred to as a Member or LLC Member. As a Member, you will have access to your own private dashboard, giving you 24/7 access to watch how your money is working for you. On April 5, 2012, President Obama signed into law the JOBS Act, thereby increasing investor access to private real estate investments like those offered here on TripleNetZeroDebt.com. In order to implement the JOBS Act, the SEC (Securities and Exchange Commission) was tasked with making rules that will allow all investors – both accredited and non-accredited – to participate in real estate Crowdfunding. Until the final rules are released, TripleNetZeroDebt.com must rely on existing exemptions under Regulation D, Rule 506 which limit our offerings to Accredited Investors. The good news is that the SEC is making progress: Title II of the JOBS Act, which lifts the ban on general solicitation for securities offered under Regulation D, Rule 506, went into effect on September 23, 2013. This means that TripleNetZeroDebt.com can now advertise investment properties listed on our site to anyone. However, investing activity is still limited only to Accredited Investors. We are anxiously waiting final rulings from the SEC and look forward to exploring how Title II will expand our business in the future. A Co-Owner is an accredited investor who has purchased an undivided interest in one of our properties with an invested amount of $100,000 or more. Once an undivided interest is purchased by the accredited investor, they will be referred to as Co-Owners. As a Co-Owner, you will have access to your own private dashboard, giving you 24/7 access to watch how your money is working for you. Co-Ownership is the pooling together of individuals who wish to purchase the same property and own the property together as a small group. This form of ownership is legally referred to as Tenants In Common. What is a TIC (Tenant In Common)? TIC stands for Tenants In Common. Tenants In Common is a legal form of ownership of real property. While most people understand the word “Tenant” to mean someone who is renting from another, a TIC is a form of shared ownership of real property by co-owners. It is a shared form of ownership between multiple people or multiple entities or a combination of both. TICs allow for unequal size of ownerships and can be freely transferred or sold to other owners/buyers. A transfer of a TIC can be done during the owner’s life or by way of a will. LLC stands for a Limited Liability Company. Like a corporation, a limited liability company or “LLC,” is a separate and distinct legal entity. This means that an LLC can obtain a tax identification number, open a bank account and do business, all under its own name. The primary advantage of an LLC is that its owners, known as members, have “limited liability,” meaning that, under most circumstances, they are not personally liable for the debts and liabilities of the LLC. An LLC has at least one Managing Member that handles the day to day operations of the LLC. In most cases, the principle of JDS Real Estate Inc., Jason Schwetz, will be the Managing Member of the LLC. What is the difference between a Co-Owner and an LLC Member? A Co-Owner is an individual that has invested $100,000 or more in the property and therefore owns an undivided interest in their name in that property. Their personal name (or the name in which they make the investment with) will appear on the title to the property. An LLC Member is someone who has invested less than $100,000. Individuals that invest less than 100,000.00 will become a Member of the LLC. The LLC is a Co-Owner of the property along with the other Co-Owners. LLC Members earn a slightly lower rate of return than Co-Owners. What types of properties does TripleNetZeroDebt.com offer? Existing cash-flowing, 100% leased, debt-free single-tenant real estate occupied by tenants like McDonalds, Dollar General, 7-11, Fresenius or DaVita Dialysis. These are examples of high-quality, low-risk (and often times Credit Rated) tenants that often occupy single-tenant properties. Triple Net (also referred to as NNN) is a type of lease that requires the tenant to pay for the Taxes, Insurance, Utilities and Maintenance on the property. Why No Debt (Zero Debt)? Purchasing TripleNetZeroDebt.com real estate debt-free completely eliminates the risk of a lender foreclosure. This provides a high level of security (as well as a good night’s sleep) in the event of a vacancy. Additionally, purchasing debt-free avoids all the costs associated with financing, such as interest costs and points, which can significantly affect your rates of return. A Reservation fee is an amount sent to TripleNetZeroDebt.com that is used to “hold” a portion of the investable amount needed aside for you until all of the money is needed to close. A minimum of $1,000 per $100,000 investment is the Reservation Fee with a minimum of a $1,000 Reservation fee. For example, if you are looking to invest $100,000 into a TripleNetZeroDebt.com property, you will send $1,000 to “hold” that portion of the investment aside for you. Approximately 15 days prior to the close you will need to send the balance (in this example $99,000) of your investment. If for any reason the property does not close, ALL of your money sent, either the Reservation Fee or the balance will be returned to you in full. Purchasing and owning high-quality single-tenant properties significantly reduces management and operational costs. High-quality single tenants are typically financially secure and capable of running a successful business and thus far more likely to pay their rent. TripleNetZeroDebt.com LLC contracts with JDS Real Estate Inc. to manage the properties. The property manager ensures that the tenant complies with all the terms and conditions of the lease, coordinates communication, distributes the monthly lease payments to the Co-Owners and Members, prepares regular reports and distributes year-end financial information. If I am a Co-Owner in a property that is managed by JDS Real Estate Inc, and something happens to JDS Real Estate Inc, what happens to my Co-Ownership? Nothing! The Co-Owners have the right to remove and appoint a new property management company. The existence of JDS Real Estate Inc. will not affect your Co-Ownership. If I purchase a Co-Ownership with TripleNetZeroDebt.com and something happens to TripleNetZeroDebt.com, what will happen to my Co-Ownership? Nothing! You own the property, not TripleNetZeroDebt.com. TripleNetZeroDebt.com is only the site that showcases the properties. Although the principal of TripleNetZeroDebt.com will also be a Co-Owner with you, the status of the site will have no affect on your ownership. Who makes the decisions for the Properties? Prior to closing, a tenancy-in-common agreement, if needed (or “operating agreement”), is executed by all Co-Owners. This operating agreement outlines the relationship among the Co-Owners and how decisions are to be made. While most operating agreements are slightly different, they allow for the property manager to make all of the day-to-day decisions and the Co-Owners act as passive owners on the property (you won’t be getting any calls that the toilets are clogged up). If a property is purchased as a Tenants In Common, the Managing Tenant (in most cases this will be the Principal of JDS Real Estate Inc.) will make the minor decisions beyond the day-to-day operations. In the event of a major decision such as the sale of the asset, a vote of the Co-Owners would be taken by the Managing Tenant or Managing Member in the case of an LLC. For practical purposes however, because the tenant and lease are already established before the purchase, there are very few decisions to be made. This makes your real estate investing life simple! If I become a Co-Owner in a TripleNetZeroDebt.com property, will I be able to sell my ownership? Each Co-Owner receives an undivided fractional interest in the property. Therefore, each has the right to sell their portion at any time. The tenancy-in-common agreement (TIC) gives the other co-owners the first right to buy if one of the co-owners decides to sell. The resale of a TIC interest in a debt-free property is made easier because a new buyer does not have to qualify for an existing loan. All of the Co-Owners can also agree to sell the entire property whenever they choose. A TIC ownership can be listed with a real estate broker or sold by owner. 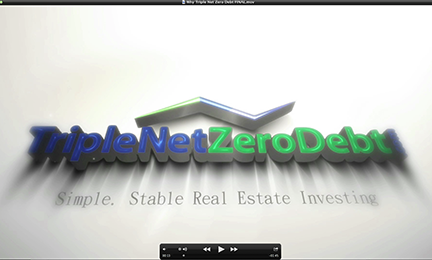 Your undivided interest in a TripleNetZeroDebt.com property is not intended to be a liquid investment. A formal primary or secondary market for undivided interests in real property does not exist. Although there is no readily available primary or secondary market for undivided interests in real property, you can sell your Co-ownership share at anytime. Any price that is achievable is subject to many variables, including the basic metrics of supply and demand. TripleNetZeroDebt.com is intended to be a long-term, conservative, illiquid investment. TripleNetZeroDebt.com can also serve as a resource for a Co-Owner seeking to sell their fractional interest. If I become a Member in the LLC of a TripleNetZeroDebt.com property, will I be able to sell my ownership? The LLC receives an undivided fractional interest in the property. Therefore, each of its Members has an interest in the LLC which, in turn, owns an undivided interest in the property. While a Member does have the right to sell their portion at any time, we cannot guaranty its saleability. The LLC Agreement (LLC) gives the other Members the first right to buy if one of the LLC Members decides to sell. The resale of an LLC interest in a debt-free property is made easier because a new buyer does not have to qualify for an existing loan. LLC Members’ interest in a TripleNetZeroDebt.com property is not intended to be a liquid investment. A formal primary or secondary market for LLC interests in real property does not exist. Although there is no readily available primary or secondary market for LLC interests in real property, you can sell your interest at anytime in accordance with the LLC Agreement. Any price that is achievable is subject to many variables, including the basic metrics of supply and demand. TripleNetZeroDebt.com is intended to be a long-term, conservative, illiquid investment. TripleNetZeroDebt.com can also serve as a resource for LLC Members seeking to sell their interest. What are the ongoing costs of being a Co-Owner in a TripleNetZeroDebt.com property? There are only two small ongoing costs a Co-Owner incurs. One is the property manager’s fee, which is typically only between $30 and $35 per month. The second is the online information storage fee. This is the cost necessary to maintain and store all of the Co-Owners information as it relates to their undivided interest in the properties on this site. This fee is only $5.00 per month. Does it cost money to join TripleNetZeroDebt.com? No. Joining TripleNetZeroDebt.com and browsing the marketplace is free. Should you choose to become a Co-Owner, there are two fees associated with each property. The fees are outlined above in “What are the costs of owning a TripleNetZeroDebt.com property?” In addition to administrative and legal expenses, the fees will cover the ongoing reporting and communications for the Co-Owners. The property manager sends a payment to each Co-Owner during the first week of each month (or quarterly) in the form of a mailed check or direct deposit into your bank account. The size of each payment determines if the payments are made monthly or quarterly. This determination is made prior to the close escrow. How many Co-Owners are there in an average property? TripleNetZeroDebt.com properties are designed to be smaller in scale than those offered by other real estate sponsors. While many TIC properties have 30 or more individuals involved, most TripleNetZeroDebt.com properties have fewer than ten. The worst case scenario would be if the tenant vacated the property or went out of business. This would only cause an interruption in the cash flow. However, because there is no debt to service you would not be in danger of losing the property to a lender foreclosure. In this circumstance, the Co-Owners could elect to have the property manager find a buyer or a new tenant to lease the property. By design, TripleNetZeroDebt.com properties are smaller, well-located, freestanding buildings which are typically much easier to lease than a larger facility. It is important to point out that TripleNetZeroDebt.com only works with strong corporate tenants with excellent track records and proven business models and often credit rated. Can I buy a TripleNetZeroDebt.com property with funds from my 1031 exchange? At this time, this is not offered through this site. However, give us a call (805-496-8559) and we can discuss your options. Can I buy a TripleNetZeroDebt.com property with my IRA or other retirement account? Yes. Many Americans are taking a more active role in their retirement planning. Self-directed IRAs and other similar programs allow you to decide where to invest your money. A TripleNetZeroDebt.com property is a tremendous option for your retirement account as it is designed to provide security and a very predictable, reliable return on your investment. When investing in a REIT, most investors have little to no information regarding actual properties the REIT invests in and cannot invest in their own backyard. With TripleNetZeroDebt.com, Co-Owners can invest in individual properties which give added transparency and control over investment selection and location. Additionally, unlike a REIT, your name appears on title along with the other Co-Owners in which you receive a copy. This is just one way of having full transparency of your investment. How does an investment get listed on TripleNetZeroDebt.com? TripleNetZeroDebt.com researches hundreds of potential properties prior to selecting properties for this site. The TripleNetZeroDebt.com team reviews due diligence materials and determines whether the property is a good fit for our Co-Owners. We anticipate that less than 1% of properties researched will be showcased as a result of this vetting process. When posting properties on this site, what criteria does TripleNetZeroDebt.com look for? At TripleNetZeroDebt.com, we are low-risk, cash flow investors looking for real estate to provide cash flow to our Co-Owners immediately. Unlike other investments, TripleNetZeroDebt.com properties begin to pay distribution on the 3rd full month from the close of escrow. The first two months worth of rental income is held in reserves in a U.S. bank account. What does TripleNetZeroDebt.com do to pre-vet potential properties? All potential properties are reviewed in-house. We go to great lengths to fully understand the variables of each property, the market statistics, the quality, track record and reputation of the tenant occupying the property. While TripleNetZeroDebt.com cannot provide an assurance to its Co-Owners or Members that the investment objectives of any given property will be reached, only a small percentage (we estimate less than 1%) of properties we review will be included in the TripleNetZeroDebt.com marketplace. What are the benefits of using TripleNetZeroDebt.com? TripleNetZeroDebt.com makes it easy for accredited investors to invest in high-quality, low-risk, and conservative real estate. We provide access to high-quality, low-risk real estate that was historically out of the reach for most small investors. We spend countless hours sourcing single-tenant properties so you don’t have to. We also allow you to invest in real estate with dramatically smaller check sizes. Instead of needing millions of dollars to purchase properties like the ones on this site, you can participate for as little as $10,000 as a LLC Member or for a minimum of $100,000 to become a Co-Owner. We make the process painless allowing you to screen investments online, sign legal documents online and have access to all your documents in one place on your dashboard. Is the TripleNetZeroDebt.com website secure? Yes. We go to great lengths to ensure the security of all of our members and Co-Owners and our data and use SSL. SSL (Secure Sockets Layer) is the standard security technology for establishing an encrypted link between a web server and a browser. This link ensures that all data passed between the web server and browsers remain private and integral. SSL is an industry standard and is used by millions of websites in the protection of their online transactions with their customers. Although no investment is guaranteed, one benefit of investing with TripleNetZeroDebt.com is that Co-owners are purchasing an undivided interest in a piece of real property in which your name will appear on title and Members are purchasing a fractional interest in an LLC that is Co-owner. There is no loan to be concerned with. When I invest as a Co-Owner in a TripleNetZeroDebt.com property, what do I own? When you invest (purchase) in a TripleNetZeroDebt.com property, you are purchasing an undivided interest in real property. Your name will appear on title (Deed) and you will receive a copy of the title (Deed). The real estate you find on TripleNetZeroDebt.com are private transactions in physical properties around the United States. The investments are not traded on public stock exchanges and cannot be easily sold or traded. Different properties have different expected “hold periods.” A hold period is the anticipated time Co-Owners will be involved with the property until it is re-sold. This can range from 1 year to greater than 10 years. It is important to read the operating agreements for a deeper understanding of the hold period for each property. Although there is no readily available primary or secondary market for undivided interests in real property, you can sell your Co-Ownership share at anytime. All investments carry some level of risk. Similar to investing in the stock market, there is no guarantee when you are investing in real estate. The real estate market has economic cycles and it is difficult to know how and when the economy will change. TripleNetZeroDebt.com has structured each property to reduce risk as much as possible. There is NO risk of a lender foreclosure since there is no debt. This means that even if the tenant of the property stops paying rent or vacates, you will not lose your property due to a lender foreclosure. Federal securities law requires that securities issued by private companies to their investors must be registered with the Securities and Exchange Commission (SEC) unless the offering qualifies for an exemption from registration. One exemption from registration is available if the company offers securities only to accredited investors in a private offering. Accredited Investors are defined by the SEC as having $200,000 of annual income per individual ($300,000 per couple) with the expectation of that continuing, or a net worth of more than $1 million, excluding the value of the primary residence. TripleNetZeroDebt.com is a private, password-protected network for accredited investors in order to meet these guidelines. Your Co-Ownership or LLC Member status is not final until the property escrow closes, all of your legal documents are signed and funding has been contributed. When you make your investment, the money is held securely at a U.S. Bank or Escrow Company. Once the required equity target is met, the money is transferred for the sole purpose of the property you are becoming a Co-Owner or LLC Member in. If the minimum needed to close the property is not met, 100% of your monies are returned directly to you. TripleNetZeroDebt.com will post timely updates to your dashboard at least quarterly. Updates will be provided via your dashboard. In addition, you will receive year-end documentation of your distribution from your property on TripleNetZeroDebt.com. Because these are single-tenant freestanding buildings occupied by a high-quality low-risk tenant, there is very little reporting or updating. Yes. Either $50,000 or $100,000. The minimum investment is $100,000 for those who wish to earn the higher rate of return. Investments of less than $100,000 (however, no less than $50,000) will earn a slightly lower rate of return. Why do Investments of less than $100,000 earn a less rate of return? Those that wish to invest less than $100,000 will become members in an LLC which will be a Co-Owner along with the other Co-Owners of the property. Due to the costs associated with adding an LLC as a Co-Owner, the members of that LLC will receive a slightly lower return. There are added expenses of having and maintaining an LLC. All expenses associated with the LLC will be paid for by the Members of that LLC only. Additionally, there must be a minimum amount of money invested in the LLC by its members in order to make the LLC viable. This amount will vary depending on the property; however, it will likely be in the range of $200,000 to $350,000. Some (not all) of the costs normally associated with the formation and maintaining of an LLC are: legal expenses, annual fees and taxes, bookkeeping costs, accounting costs, tax returns, etc. TripleNetZeroDebt.com properties typically do not have capital calls. A capital call is where the investor is required to commit more money to the property, beyond the initial investment. This is unlikely since the properties are purchased debt-free and are 100% occupied by strong tenants. What are the tax implications of investing with TripleNetZeroDebt.com? While we cannot provide legal or tax advice, we recommend you speak with your own accountant or attorney. One of the benefits of Co-Ownership in real estate with us is that our structure allows for full “pass-through.” For example, profits, losses and depreciation can be passed through to the Co-Owners. What is unique about TripleNetZeroDebt.com? TripleNetZeroDebt.com was created to give smaller investors the ability to make direct real estate investing simple and affordable. Other “real estate Crowdfunding” sites are “platforms,” meaning that the site is only acting as a “host” for any sponsor who wishes to post their transaction on the site. TripleNetZeroDebt.com is neither a platform nor a host site. We are real estate professionals with 30 years of experience in commercial retail real estate acquisitions, investing, leasing, management and development. We find and vet all of our own properties before putting them on our site and making them available to our potential Co-Owners. You will be a Co-Owner or LLC Member along with the principal of TripleNetZeroDebt.com. Our “skin” is in it, right along with yours. TripleNetZeroDebt.com is laser focused on high-quality low-risk commercial real estate where being part of the property ownership is available to the individual smaller real estate investor. Our goal is to attract qualified, potential Co-Owners and LLC members to www.TripleNetZeroDebt.com.com utilizing on-line and traditional means of advertising to include newspaper, magazine articles, blogs, and search engine optimization. TripleNetZeroDebt.com believes that with the ease of access to the internet and the transparency of the internet, TripleNetZeroDebt.com can deliver high-quality low-risk real estate to the conservative real estate investor. These are the primary ways that we are unique and different. Is TripleNetZeroDebt.com available to foreign investors? Yes, Co-Ownership in a TripleNetZeroDebt.com property may be purchased by anyone who is not a resident of the United States, subject to local securities laws. If I become a Co-Owner or LLC Member, will I receive distributions and how often? Yes. Distributions are scheduled on a monthly or quarterly basis depending on the property and the size of your distribution. The amount of each distribution is determined by the amount of rent the tenant pays per month. You will know what your distribution will be prior to the close of escrow. The amount of your distribution will remain the same until there is a change (if any) in the rent being paid by the tenant. When does a Co-Owner or LLC Member begin to earn distributions? You will be paid your proportionate share of the rent (less the management fees) starting with the 3rd full month of paid rent by the tenant. The first two months of rent from the tenant are held as reserves. Generally, distributions that you receive will be taxed as ordinary income. We expect that some portion of your distributions may not be subject to tax in the year received due to the fact that depreciation expenses reduce taxable income. This defers a portion of your tax until the property is sold or liquidated, at which time under current tax laws you will be taxed at capital gains rates. Consult your tax professional for more details. When will I receive tax return information? TripleNetZeroDebt.com will provide you with an annual spreadsheet detailing your distributions on or before March 31st of each year. This spreadsheet can be taken to your tax professional for the preparation of your tax returns. TripleNetZeroDebt.com does not prepare tax returns for its Co-Owners who have invested $100,000 or more. If you have invested less than $100,000 and are a member of the LLC, you will receive a K1 for you to take to your tax professional. We put our money where our mouth is on all our properties. Our business model is triple-net single-tenant property purchases for all cash. We are NOT a fee-based intermediary for capital-seeking third parties. “Let’s Build Wealth Together.” We invest alongside you. Properties have to be good enough for us to be good enough for you.